Enter Coupon Code: "aprilpromo5" at check-out to save 5% and also receive FREE Travel Bidet. Note: For TOTO's newest washlet, please see TOTO S550e. The TOTO S350e Washlet has a contemporary design and comes with all the main features and functions you would expect in a premium bidet toilet seat. Equipped with both posterior and feminine wash features - water temperature, water pressure, and the position of the spray can all be adjusted with the handy wireless remote control. Speaking of which, the remote control has been totally redesigned too. It is now rectangular shaped (so it fits nicely in one hand like a TV remote) and has been upgraded to include two user presets. The user presets allow you to pre-program wash settings (e.g., water temperature, pressure, spray position) right into the remote. Some of the other features you'll find is a pre-misting feature which pre-mists the toilet bowl with water before use. This make flushing more efficient and effective compared to flushing a dry bowl. The use of innovative eWater Technology is another great addition. This feature mists your toilet bowl with electrolyzed water which keeps the bowl cleaner and helps reduce the need for harsh chemical cleaners. There's also a new LED night light - very handy when using the restroom in the middle of the night. Other features include an automatic opening and closing lid. A heated toilet seat, warm air dry, occupied seat sensor, automatic air deodorizer, and power saving mode rounds out the rest of the main features of this TOTO Washlet. Available in Cotton White and Sedona Beige. From the pioneering originators of the electric bidet seat comes the TOTO S350e washlet. TOTO has been a leading innovator in the industry for over 30 years, and the S350e is the model at the head of the class. You can read our in-depth official review of this seat here: bidetsPLUS' TOTO S350e Review. Continue reading below for a less formal summary highlighting some of the unit's main features. The S350e uses a wireless remote control for operating its many features. The remote is two-sided with buttons for the primary operations on the front, and the less often used buttons, e.g., adjustment controls, located on the back. This design gives the front of the remote a cleaner look. In addition to common operations such as rear wash, front wash, air dryer, oscillating mode and pulsating mode, the front of the remote also has two user presets at the bottom so you can recall your assigned preferences for two different users with these buttons. 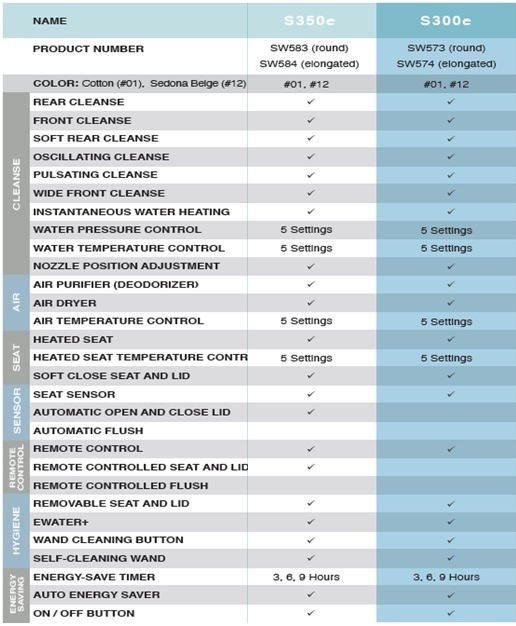 As you would expect in a high end model, the S350e has adjustable water pressure, water temperature, nozzle position, adjustable temperature air dryer and heated seat. It also has a tankless water heating system for continuous warm water. Tankless water heating is more energy efficient than reservoir tank water heating, plus it provides continuous warm water without running out of heated water which can happen with the reservoir tank units. An additional feature on the TOTO S350e is the “eWater” function. This feature uses electrolyzed water, which is a commonly used disinfectant, to mist the toilet bowl before and after use to keep matter from adhering to the bowl. This also cuts down on the need to use abrasive chemicals when cleaning. Throw in the self-cleaning wash nozzle and the S350e makes it easy to keep yourself and itself clean and fresh looking. Other non-washing features of note on the S350e include an LED night light and automatic open/close lid feature. The unit has a sensor that is activated when you approach and automatically raises the lid. After use when you leave the sensor’s range, the lid will then automatically close. Definitely a cool high-end feature for a hands-free experience. Another aspect of the S350e worth mentioning is the streamlined design of the unit. The body of the S350e is much sleeker and more compact than other models with a narrower profile which gives it a clean, modern look. All told, the TOTO S350e offers a premium bidet seat with all its high end extras. It is truly a top of the line bidet seat from one of the industry’s most recognized names. What is the TOTO S350e? The TOTO S350e is an electronic toilet seat that provides a warm water wash after using the restroom. TOTO actually trademarked the term "washlet" to describe their products but they are also commonly referred to as bidet seats or bidet toilet seats as well. When was it released? The TOTO S350e was released in Fall 2012. It is TOTO's flagship model, replacing its predecessor the S300. Notable upgrades include a new thinner design and also included is the addition of e-water (electrolyzed water) mists the sides of the toilet bowl which helps minimize toilet bowl scrubbing. Where is the washlet made? The TOTO S350e is made in Malaysia. Being a Japanese company, many customers assume everything TOTO makes is made in Japan. But there were cost efficiencies in opening a manufacturing plant in Malaysia, and TOTO decided the washlet units would be made there. Why would this model be a good choice? The TOTO S350e looks fantastic. It has a slim profile and will blend in well with the rest of your toilet. If aesthetics are paramount, the S350e would be a good choice. Also performs quite nicely. It's a fine-tuned machine, as TOTO has been in the game a long time. Q: What are the differences between the TOTO S350e and the S300e? A: These two models from TOTO are hard to tell apart by looking at them, and that’s because they have the same body construction. They even have all of the same features except for one important difference: The S350e has an automatic opening and closing lid feature not available on the S300e. You can also raise and lower the seat of the S350e by pressing a button on the remote control. Q: How does the e-water feature work? 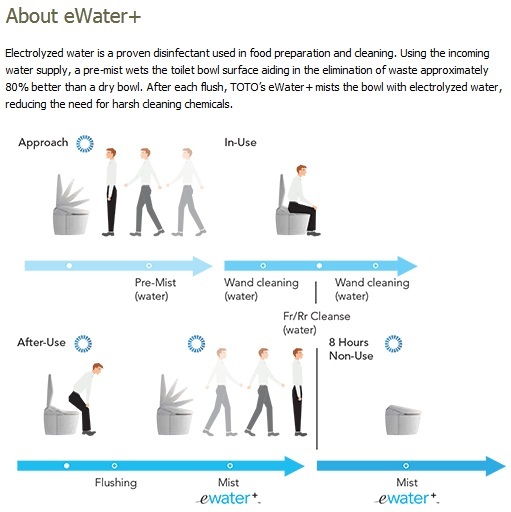 A: E-water technology is an added feature to help keep the bowl of the toilet clean. It works by first spraying a pre-mist of water into the bowl to wet the surface to help prevent material from adhering to the surface of the bowl. When you are finished, the unit sprays another mist with electrolyzed water which acts as a disinfectant. The e-water feature is designed to reduce the amount of harsh cleaning chemicals needed to clean your toilet. Q: How does the automatic lid feature work? A: As mentioned before, the TOTO S350e includes an automatic opening and closing lid. A body sensor on the unit detects whenever you approach the toilet and will automatically raise the lid when you are within about a foot of the unit. After use, the lid will close after about 90 seconds once you have left the area of the sensor. If you wish to raise the seat, you can press the button on top of the remote to raise the seat too. Q: Can the automatic lid feature be disabled? A: Yes, you can disable this feature thru the remote control. Disabling would effectively turn your S350e into and S300e! And of course you could re-enable it later if you wish. Q: What is the height of the bidet seat? A: The body of the TOTO S350e has the narrowest profile out of all our electronic bidets. The height of the bidet at its highest point is 4” compared to other models that are between around 5.5” to 7” at their tallest point. Q: Is the remote control easy to use? A: Yes, it’s really easy and convenient to use. Although the remote is double-sided, the most commonly used buttons such as wash, dry and stop – are located right there on the front. The back of the remote control is used more to adjust settings such as water temperature, water pressure, sleeping hours, etc… and once you set those you rarely need to change them again. This makes the front of the remote less cluttered with buttons, and easier to use. The remote is really well thought-out and has a nice design. Q: If I have guests come over, can they use the toilet like a normal toilet without using the bidet features? A: Yes, if they don’t turn on any of the features - the bidet seat acts like any other toilet seat. So your guests can still use your toilet just as they would any other toilet. Q: How does the installation work? Do I need a plumber? A: All our bidet seats are designed for DIY (Do It Yourself) installation and the process takes about 30 minutes. To remove your old toilet seat, reach underneath the mounting holes and unscrew the bolts which keep your seat in place. Then affix the bidet’s mounting bracket and secure it by tightening a couple bolts. To hook up the water, all you’re doing is untightening some hoses and then re-tightening them back together. Anybody can do it – no special skills are required and you don’t need a plumber. All parts required for installation come included in the box. Q: Can I install the TOTO S350e, on a non-TOTO toilet? A: Yes of course! The washlet is compatible with all different types of toilets. You don't need a TOTO toilet for it to work. To check for compatibility, you just need a minimum of 1.75 inches from the front of the water tank to the center of the mounting holes. Please see our fitting guide which will walk you through a couple of easy measurements. Q: What’s the best way to clean the unit? A: We recommend you use mild soap and water. Avoid using harsh chemicals like Lysol or ammonia, as they can damage and discolor your seat over time. Wiping it down with a soft cloth, moistened with a little soap and water will keep your bidet looking like new. It is surprisingly easy to keep clean. The product was delivered as expected, very easy to install. Everything has worked properly and we are pleased with our purchase. If I had to come up with a negative it would be that the price is very high. Very intuitive with lots of options. Makes the trip to the loo sheer pleasure. It’s Warm and inviting to the touch not to mention the spigot self cleaning before and after use. Easy to install as well. Highly recommend. The best. Worth the money. Tried this seat at my sister's house while I was staying with her. Was really impressed so I ordered one while I was still there! My sister bought hers from Bidets Plus so I called and talked to a sales rep who was really helpful and took my order. The bidet arrived around the time I got back home and installed it myself in about 30 minutes (and I am not a handy person). A wonderful, spa-like experience in the bathroom. So nice to have that shower fresh feeling. Can't believe it took me so long to discover this product. It is amazing and something I use every day! This bidet performs so well, we named it Otto. Good morning Otto! It is a pleasure to use , performs exactly as described, took no time to install, well my peeps did it for me, but was instantly working , so worth it, and very stylish. Like many others we fell in love with this toilet system when visiting Japan. This product works very well. We had an electrician put in the outlet, but then installation was easy. This product is easy to install and also easy to operate it just a plug and play system. Okay, you likely don't need -this- unit. But a bidet...yeah, you need one. After 69 years of dealing with this issue the old fashioned way, I knew there had to be a better way. I knew the bidet was that way but always thought it meant a separate appliance and American homes are not designed for that separate appliance. The bidet seat fixes that. We chose the TOTO S350e because I've long known that one should always buy a better product than one needs for the job because the better product will make the job easier. The TOTO does just that. It wets down the sides of the toilet before use, it warms the toilet seat, it filters the air, it raises and lowers the lid -and- the seat as well as performing the service we bought the seat to do. Installation was as simple as the videos show. All the parts are included. It took less than an hour to open the package, look at everything, read the instructions and install it. A quick note for people who haven't done this type of thing before: Not all shut-off valves will completely stop the water so one should be prepared to make the plumbing changes while water is dripping out of the hose. And when attaching the tee fitting to the bottom of the tank, it is possible to twist the internal pieces inside the tank out of alignment. Having someone hold them when tightening the Tee to the tank might be advisable. We used an extension cord to get to the electricity. Now that we know we will be using the unit long term, we will be getting an outlet installed next to the toilet. We love the unit. About the only thing it doesn't do is flush the toilet. Buy it if you can afford it. If you can't afford it, buy a seat that performs the basic services because a bidet is truly a MUCH better solution than buying rolls of toilet paper. I have been using mine for 3 months now, and it is wonderful. BUT for the price, I think they should have made the ENERGY SAVER function a bit more robust. FIRST, setting it up is confusing and limited, needs to be more like the thermostats, with a time, weekly, and multi programs per day options. Purchased the TOTO S350e washlet after I experienced use of various washlets during a visit to Japan. The S350e in my opinion works as well as the much higher priced integrated units. Installation was simple and the operating manual has clear descriptions of all functions. The washlet s350e exceeded my expectations! I am so pleased! I have to go numerous times during the night and the automatic features make it much easier. I highly recommend this product. I love this bidet, and it has done us most well for the last year and a half. But yesterday the drying fan suddenly stopped working. 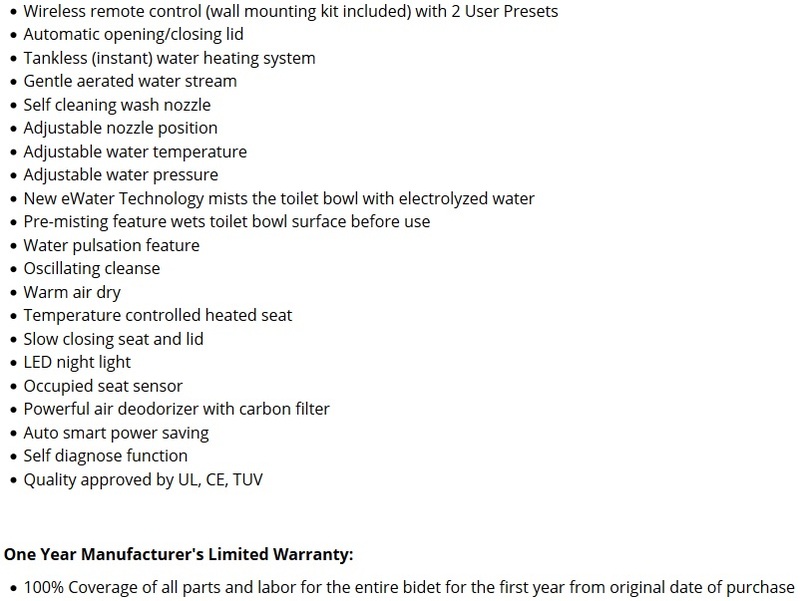 I was very disappointed to find out that TOTO's warranty was only 1 year and that I would have to pay for shipping and repairs to mail it to their repair place in Ontario, California as well as live without a bidet for however long that could take. If the product was built to last longer, or the part was self serviceable I would definitely give it 5 stars. I come from Europe and I am used to it. We have separate bidets there so you have to transfer to the bidet after the toilet. The TOTO S350e is even better. It does everything for you, you just touch the remote control and the rest is fabulous. It is very easy to install, you really do not need a professional. It is a beauty and luxury at the same time. The best decision we have ever made. I can't imagine not having one of these amazing bidets. Not only do I have one for my bathroom but I have another in my guests bathroom for my family and friends. Yes, I own two. They are thrilled when they see it and in love after the use it. Beautifully made and discreet in size. Yes it's a beautiful thing! Used a bidet in Japan and was hooked! I purchased the Toto S350e bidet. A friend installed the unit for me. I have invited my friends to come and try it. I don't know why I didn't get one sooner. I like the warm seat and the warm water that is used. You can even change the temperature if you like. I also like the idea that the lid opens when you stand in front of the toilet. A remote control is included to change position, water pressure, temperature and you can actually program it for two different people. There is an energy saver program you can use. What more can you ask for. You will not be sorry if you purchase one. Very nice product. My only complaint is the drying cycle takes a long time. If fan were stronger it would be perfect. Had a plumber install the unit. Went smoothly and at a reasonable price. I encourage the purchase of this unit. Europeans use bidets as a matter of course. They've been around a bit longer than us and just may know a few things. It's a very reasonable and fab luxury. And this unit is THE BEST.